Leaf piles are made for jumping! The scrape of an old metal rake against the sidewalk and the crunch of the leaves as they gather and fly through the air and quietly land, over and over, is almost like a dinner bell ringing. 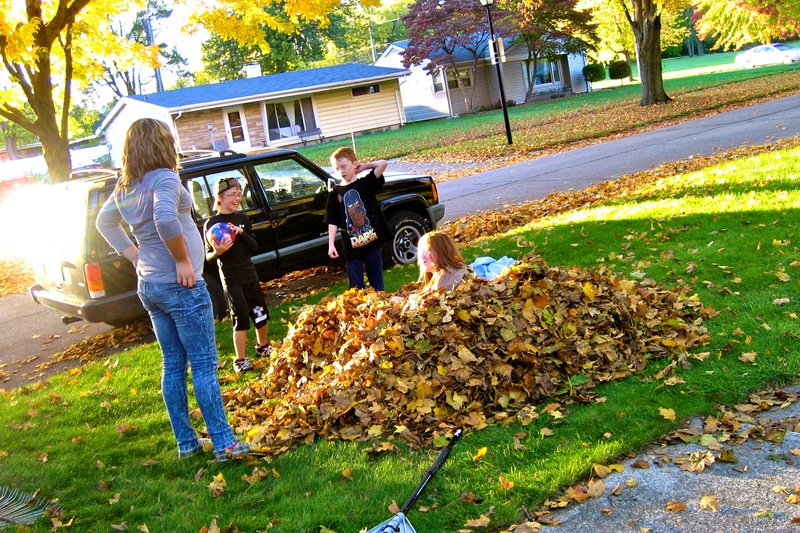 Every year, as soon as the first leaf falls, my kids begin anxiously awaiting the first leaf pile jump. It’s an awesome day of giggles, laughs, and squeals you can hear echoing up and down the block. Tonight the air was cool and crisp, but not too cold. It was perfect fall weather for a massive jump-a-thon. The gang suited up in sweatshirts and ran into the yard for a night of family fun. It’s not every day that the perfect leaves, the perfect weather, and the unscheduled night all fall on the same date. It was a memory night waiting to happen. When the good days come, sometimes we just roll with them… even if that means we don’t go inside to eat dinner till 8pm. Who wants to go inside when the leaf pile is calling? Alli in her pile of leaves – looking particularly happy! So we made piles till dark, ate a fast dinner before bed, and the kids were asleep as soon as their heads hit the pillow tonight. It’s days like this that I remember how truly blessed I am. It’s the dream in my head I imagined it would be like when I was a growing girl dreaming of my grown-up days to come. Now I am living in my future and I am overwhelmed with the beauty of what God truly gifted me with. I am so blessed. 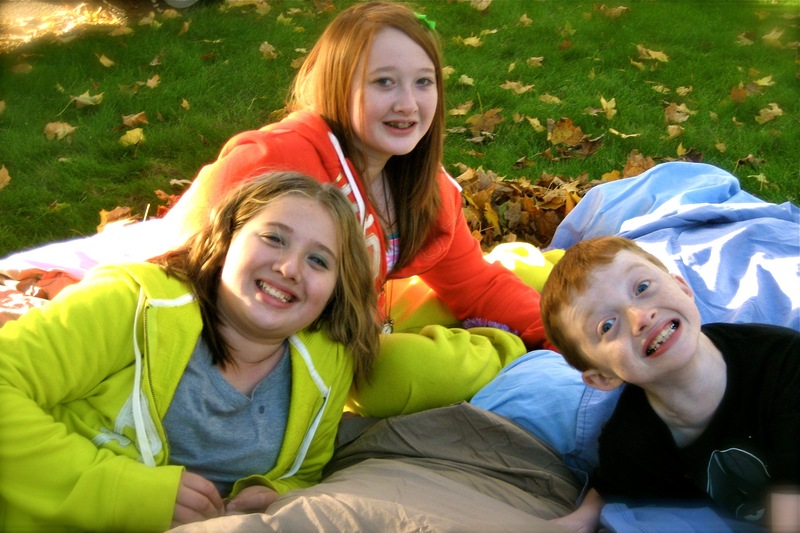 Alli, Linds, and Drake laying on sheets they’d thrown over their leaf pile to keep them from blowing away. Wonderful imagery. I miss being a kid! 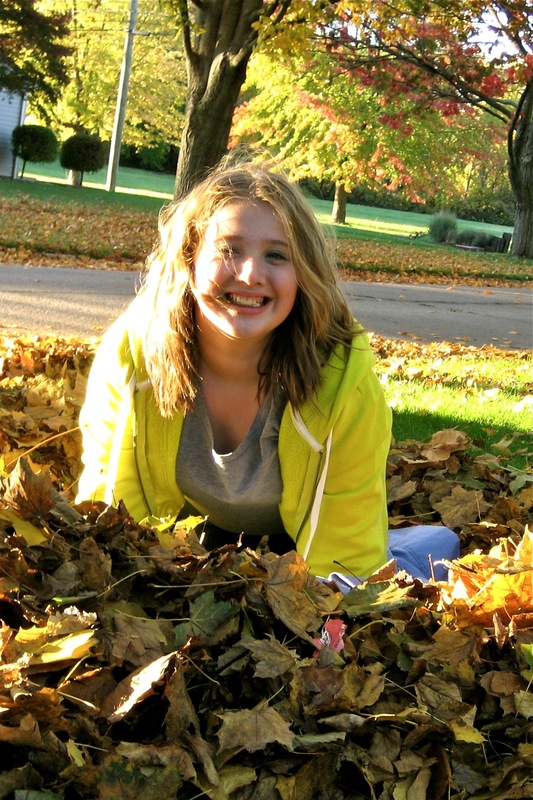 Though I don’t miss raking leaves! One of the benefits is THEY get to do all the raking! Thanks for stopping by! yeah – our kids have it too easy too! No blisters!